Chris Marshall has a mixed media/collage in the Melville Community Arts Association Exhibition "We Love Art" on display at Atwell Gallery. Chris Marshall has 2 mixed media paintings in the Melville Community Arts Association Awards Exhibition on display at Atwell Gallery. Chris Marshall had 4 paintings in the Rotary Art Show at Garden City, Booragoon. Chris Marshall sent 2 artworks to the York Society Art and Craft Awards. Chris Marshall has sent 3 of her artworks up to the Wheatbelt for the Dalwallinu Arts Festival. Chris Marshall displayed 2 of her award-winning mixed media artworks in Atwell Gallery's "We Love Art" Exhibition which is part of the City of Melville's inaugural "We Love Art" trail. Chris Marshall had some artworks for sale in Atwell Gallery's End of Financial Year Sale. Chris Marshall displayed 4 paintings in the Rotary Art Show at Garden City, Booragoon. "Surf, Sand and Sea,", mixed media artwork by Chris Marshall sold at Rotary Art Show, Garden City, Booragoon in June, 2017. Chris Marshall and several of her arty friends from Atwell Gallery are involved in a display at the inaugural Living Well in WA Festival at the Perth Convention Centre which is being organised by the Conscious Living people. All artworks for sale at very reasonable prices. Chris Marshall has 2 large artworks and a table of smaller ones on display at Atwell Gallery in their "Travelling Artist" exhibition. Chris Marshall is taking the unsold works from her "Drawn to the Sea" display at the Fremantle Sailing Club at the weekend into Atwell Gallery for their pop up exhibition from 3 to 13 April. Chris Marshall is one of the artists displaying (and selling) artworks at the Rotary District Conference at Fremantle Sailing Club, South Fremantle from 3pm Friday 31 March until 12pm Sunday 2 April. Chris's display is called "Drawn to the Sea". Public welcome, gold coin donation appreciated. Chris Marshall has sent 4 mixed media artworks to Carnamah to the North Midlands Art Exhibition which has its opening night Friday 11 September and remains on display until Tuesday September 15,2015. We hear that it's a great wildflower season so why not go for a long scenic drive. Chris received a Highly Commended in the Mixed Media section for her artwork "Wetland Morning". The Atwell Gallery artists are celebrating the International Year of Light and Light-based Technology with an exhibition entitled "Catching the Light". The gallery looks fantastic and the exhibition is on display until Sunday September 20 with an opening Sundowner on Friday Sep 11. Catch the last light as we turn down the gallery lights and view the artworks by torchlight - byo torch and "light" refreshments! Chris is displaying a projection of some of her digital art that catch the light with a framed unique state archival print of one of them "Wild" - see panel on right. Chris Marshall and Debra Scidone set up their "Ghostly Morning" set of collaborative mixed media canvases at UberCaf in Bicton. They will be on display for about a month. Chris Marshall is displaying 3 mixed media artworks in a the "It Doesn't Have to be ANYTHING!" exhibition at Atwell Gallery (Burnt Out, Out of the Blues and Fantasy in Blue). Chris has 2 artworks in the Colour and Movement Exhibition at Atwell Gallery. Gallery hours are 10am - 4pm Mondays to Saturdays and 1 to 4pm Sundays. Chris Marshall's digital artwork "Raffles Construction Site" will be part of "COLLECTED: Selected works from the City of Melville Art Collection" Exhibition at the Heathcote Museum & Gallery. Chris is one of five artists who will be giving a free short talk at Heathcote on Saturday Feb 7 at 1pm. Just got back from our camping trip to Broome having had a really relaxing time. We've had our lives hijacked over the last few months as Chris's Mum finally hit a bit of a crisis and we have had to try and work our way through the convoluted Aged Care system and move her from her retirement village unit into a nursing home. We've eventually finished clearing out her unit and its now having some work done on it prior to listing for sale - we are now heading north on a much needed break. We are just back from a few days in the WA Goldfields camping at Kalgoorlie, Lake Ballard, Leonora, Sandstone and Cue as well as visiting several places on the Golden Quest Discovery Trail like Broadarrow, Ora Banda, Kookynie, Gwalia. We were amazed on reading some of the interpretive signs how big some of the towns used to be and how many of them have just disappeared completely. 2 of Chris Marshall's mixed media / collage artworks in her "Shaped by Nature" series are on display at the Beverley Art Exhibition from April 17 to 21, 2014. Chris Marshall has been setting up her retrospective exhibition "Drawn to the Sea" which is part of the 4 x 4 x 4 series of exhibitions at Atwell Gallery. The exhibition continues until Sunday March 23 and is open to the public from 10 until 4pm daily. Chris Marshall delivered the 4 paintings in her new "Shaped by Nature" series to Atwell Gallery for the "Outside the Square" exhibition on display until February 28. Chris Marshall's mixed media / collage artworks in her "Shaped by Nature" series on display in the Outside the Square exhibition at Atwell Gallery from February 10 - 28, 2014. In mid-December we headed off across the Nullarbor travelling through the Southern Flinders ranges, Clare and Barossa Valleys and down the Coorong in South Australia and the Great Ocean Road in Victoria before taking our camper across Bass Strait on the Spirit of Tasmania. We loved Tasmania! We were only there for 8 nights but saw a fair bit of the State and certainly hope to go back for a longer trip some time. On the return journey we went up through Central Victoria and then along the Murray Valley before heading back West. We arrived home in early January then headed off again for 5 days over the Australia Day long weekend - this time we based ourselves in Hopetoun on the stunning South East coast of WA. We had a relaxing few days exploring the Eastern end of the Fitzgerald River National Park as well as the coast to Esperance including Stokes Inlet National Park. Steve and Chris are just back from a few days camping in the Mid-West region of Western Australia. A highlight was 2 days at the new river camp at Wooleen Station in the Murchison. Chris Marshall delivered her mixed media/collage painting "Reading in Bed" to Atwell Gallery for the MCAA Awards Exhibition which is on display until Thursday August 22. It won the award for Innovative/Imaginative/Original Thought. Chris Marshall's mixed media / collage artwork "Reading in Bed" is on display in the MCAA Awards exhibition at Atwell Gallery until August 22, 2013. "Bird Watching" is one of the artworks that Chris Marshall dropped off at Garden City today. Highlights included camping at Goulet Bluff in in the Shark Bay world heritage area and Crossing Pool in Millstream/Chichester National Park. Steve doing it tough at Goulet Bluff, Shark Bay! 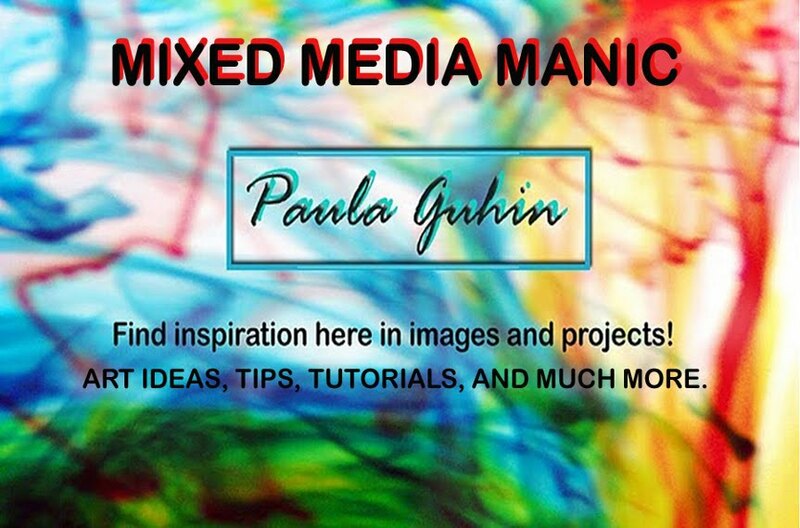 Paula Guhin invited Chris Marshall to be a "guest blogger" for her on Mixed Media Manic. Paula has done a great job on setting it up - click guest blogger to go to the actual post or on the picture at the right to go to the home page of Paula's blog. Chris Marshall delivered 3 new artworks to the "Colours of Autumn" exhibition on display at Atwell Gallery from today until Sunday May 26. Gallery hours are 10am-4pm Monday to Saturday and 1-4pm Sunday. Chris Marshall is one of the Heathcote artists exhibiting at Atwell Gallery this week (April 29 - May 5, 2013) in an art exhibition called "Out of the Kitchen" - that's because the Heathcote Artists Studios are in the Kitchen Building of the stunning Heathcote Cultural Precinct in Duncraig Road, Applecross, Western Australia. Chris will be the Artist-in-Residence at Atwell on Sunday May 5 from 1 until 4pm and she will next be the Artist-in-Residence at Heathcote Studio 5 on the afternoon of Sunday May 12. Chris Marshall finished setting up her art exhibition at the Silk Road Restaurant in Ardross, Western Australia. She's really pleased with it so why not meet your friends there and check it out? The artworks will be on display until the end of June. Chris Marshall has donated her mixed media artwork "NO GAS (James Price Point)" to a Save the Kimberley event in Sydney on April 24th being organised by young designer Karen Fulton (Zipporra) and her friends. Chris is sorting out which artworks to display in her exhibition at the Silk Road restaurant in Ardross to be set up on April 19 and be on display until the end of June. Today Woodside announced that the proposed Gas Hub at James Price Point in the Kimberley doesn't meet its commercial requirements. What a relief! Just got back from a few days camping on WA's Coral Coast, staying at Ellendale Pool, near Geraldton, Nanga in Shark Bay and Carnarvon. We were going to go further but, as the temperature was in the mid thirties and getting warmer, we were overcome with laziness and ended up staying in Carnarvon for 6 nights! Chris Marshall delivered 3 mixed media canvases to the Beverley Art Show which will be on display over Easter. Chris Marshall delivered 3 artworks to Atwell Gallery today for their "Horizons" exhibition on display until Saturday April 13th. Gallery hours are 9-4 Monday to Saturday and 1-4pm Sunday (closed over Easter). Chris will be at the gallery Tuesday and Wednesday afternoons and Thursday morning this week then all day Monday and Tuesday and Wednesday and Thursday afternoons after Easter. Chris Marshall's artwork "Traces of Time - Kalbarri" was delivered to the Mandjar Art Awards today. The exhibition is on display at the Mandurah Performing Arts Centre from Friday 15th March until Sunday 7th April. Opening hours are Monday - Friday, 9am - 4:30pm, Saturday 10am - 4pm and Sunday and Public holidays Midday - 4pm. Just got back from a few days in camping on WA's Wilderness Coast, staying at Coalmine Beach then at Ayr Sailean, both lovely spots. We did think of camping in Shannon National Park but just about got carried away by march flies when we got out of the car so didn't stay! Just got back from a few days in beautiful Esperance on the South-East coast of Western Australia. Chris started work on Traces of Time - LeGrand series. Chris Marshall and Debra Scidone are sharing a wall of Atwell Gallery in "Art in Strips" on display until Friday February 8. Debra's strip has a large watercolour and 2 lovely pastels. Chris and Deb are sharing another strip and displaying their "Gnarly Reach" set from their Mandjar Blues exhibition. Chris Marshall's mixed media artworks on her "strip" of Atwell Gallery from Jan 8 to Feb 8, 2013. Left to right are Ningaloo IX, VII and VIII with the Kalbarri paintings on the stands. Are you LinkedIn? All these artists are members, and they also belong to the group "Mixed Media/Collage." Join us there! Enjoy the smorgasbord here and make a luncheon of these links! Just got back from 11 days camping in Kalbarri on the Mid-West coast of Western Australia. Chris did another set of small canvases in her Traces of Time Project - click here to see them. She is also working on Kalbarri Series 2. Chris Marshall's mixed media artwork "Ningaloo IX - Hidden Depths" is on display in Rotary Fremantle Port's Art Show at the Lauder/Howard Building in George St, East Fremantle (opposite the Old Royal George) from Friday Nov 30 until Sunday Dec 2. Just back from another big drive to Broome and many other northern places. Click here for the full story. The Mandurah Community Museum hosted the touring exhibition – Wetlands: from Bunyip to Beautiful from 18 September- 15 November 2012. The exhibition was supplemented with displays from local organisations and artists. Photographer Ken Monson displayed a wonderful sample of the birds we see in our wetlands. Some of Debra Scidone and Chris Marshall‘s Mandjar Blues artwork explored the intriguing wetlands of the Peel region. Chris Marshall's latest artwork "The Joy of Spring" is on display in the "Spring Fever" Exhibition at Atwell Gallery from September 17-30, 2012. and then at the Bracks Library on the corner of Stock Road and Canning Highway in Melville until October 24. Chris Marshall's latest artwork "29th June, 2012" is on display in Alfred Cove Art Society's "Changing Seasons" Exhibition at Atwell Gallery from September 10-16, 2012. She also has another mixed media work "Ode to Snails" on display. You are invited to the opening event at 7pm on Tuesday September 11, but if you can't make that please call in any day between 10am and 5pm (or 4pm on Sunday, the last day). Chris Marshall is one of 6 artists involved in the Hidden Depths Exhibition curated by Margaret Coxall on display at Atwell Gallery from September 3 - 9, 2012. We have been setting up the exhibition today and the gallery looks great. We are having a "Meet the Artists" event from 2 - 4 on Sunday, Sep 9 - see you there! Chris Marshall's latest mixed media painting "It Started with a Clef" is on display in the MCAA Awards Exhibition at Atwell Gallery from August 15 - 31, 2012. It was runner-up, Best Contemporary Work. The latest in her Ningaloo series, "Ningaloo VIII - The Wreck" is also on display. Both canvases are framed with white edging. The camper wheel change project. Steve changed the wheels on the camper to match those on the car, so that they are extra spares for each other. The story is here. There is still a lot we have not seen, so we will definitely visit Karijini again. Steve's book celebrating in pictures the buildings of priest/architect John Hawes is published - sort of. It has been produced using the Blurb online print-on-demand service, and a submission has been made to a publisher in the hope that it can be published in the normal way. Click here to go to the page about the book. We were away for 6 days over Easter, camping at Geraldton, Carnarvon, Kennedy Ranges and Mt Augustus. Drove back down the inland Carnarvon-Mullewa road, overnighting at Murchison settlement. Cobra Station near Mt Augustus was a definite highlight. Kennedy Range campsite - we had the place to ourselves! Chris has just finished up setting up her 1-wall exhibition "Intriguing Wetlands" at Atwell Gallery, part of their 4-walls x 4-weeks x 4-artists per week programme. Chris's exhibition will be up until 4pm Sunday March 25. Chris will be at the Gallery most of the week but if you want to arrange a time to meet her there, phone Atwell Gallery on 9330 2800. We drove to Kalgoorlie then Norseman and back to Perth via Hyden on the Granite and Woodlands Discovery Trail. We camped at Karalee Dam, Norseman, Lake Johnston and The Breakaways. Except for Norseman, all free! Pre-dinner drinks, Lake Johnstone. Tough, but somebody has to do it. Steve played the amazing Nullarbor Links Golf Course on our Christmas break. We had a great time camping at all sorts of places in the Goldfields, across the Nullarbor and on the West coast of the Eyre Peninsula in South Australia. We were delighted to spend a night camping at Lake Ballard so got to see the Gormley sculptures at dusk and again at dawn. The Par 3 at Fraser Range. Yes, it's a pretty rough track! Chris has finished her 12 x 12 inch canvas "The Healing" and sent it to the USA where it will be part of a collaborative grid presentation in Tucson Arizona to raise funds for charity to help restore the earth. Presented by Alta Contemporary Art, Tubac AZ in alliance with Industria Studios in Tucson. Chris Marshall and Debra Scidone's Mandjar Blues Exhibition on display at the stunning Mandurah Performing Arts Centre. The exhibition features 3 bodies of work:- 1) beautiful realistic pastels and watercolours by Debra Scidone, 2) contemporary mixed media and digital art by Chris Marshall and 3) the amazing mixed media canvases where they both work on the same canvas at the same time under their joint name of Exponential Expressions.